State of the Nation 2019 - Did Kenyatta Get His Facts Right? One of the Kenya National Housing Corporation projects in Ngara, Nairobi (file photo). 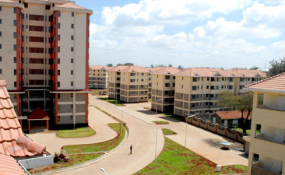 Your April salary is likely to be lower by some thousands of shillings after the government ordered employers to start making deductions aimed at funding the Jubilee administration's housing project. In a newspaper advertisement on Tuesday, the Housing ministry and the Kenya Revenue Authority announced that the housing fund levy "has come into effect", meaning every employed Kenyan must remit 1.5 per cent of their basic salary for April to the National Housing Development Fund. Employers are also required to send a figure matching the employees' deductions to the Housing fund. "The employers are required to deduct and remit the levy together with other statutory levies from both the employer and the employee by the 9th of each succeeding month together with other payroll statutory deductions. The first contribution shall be due by May 9, 2019," the advertisement stated. That means that if a person's basic salary is Sh50,000, some Sh750 of that will be retained by their employer to be remitted to the Housing fund. That means that a person whose basic pay is, say, Sh200,000 and whose deduction will be Sh3,000 plus the employer's Sh3,000, will not see Sh6,000 remitted to the Housing fund. "The employer shall remit both employee and employer contributions to the National Housing Development Fund before the ninth day of the following month," says the Act. The government promises employees whose salaries will be deducted that their levies will put them at a position to "finance the purchase of a home under the affordable housing scheme" as stated in the Act. For those who will be ineligible to purchase a home, the legislation says their deductions will -- after 15 years from the date of first deduction -- be transferred into pension money or be transferrable to a beneficiary. Affordable housing is one of the items in the Jubilee administration's Big Four agenda alongside food security, universal healthcare and manufacturing. Tuesday's advertisement, which was signed by the Housing principal secretary and the KRA commissioner-general, did not make reference to a case that the Central Organisation of Trade Unions (Cotu) filed last year to challenge the levy. "Regulations have not been developed to guide the implementation of the levy. It is also worth noting that there was no public participation in the amendment which was brought through the omnibus Finance Act, 2018," the lawyer argued. Cotu secretary-general Francis Atwoli was not immediately available for a comment on the matter, same as Federation of Kenya Employers' CEO Jacqueline Mugo. "We had injunctions that halted the process, but the parties have agreed to withdraw them so we are ready to proceed with the project," said Mr Macharia, adding that construction of housing units will begin in a few weeks after the start of the deductions. "The project is now clear and will be launched in a few weeks. The first 2,000 units will be constructed in Park Road in Nairobi," he said.